It was a mixed week for US equity indexes, with net changes ranging from +0.3% (Dow, NYSE comp', R2K), -0.3% (Nasdaq comp'), to -1.1% (Transports). 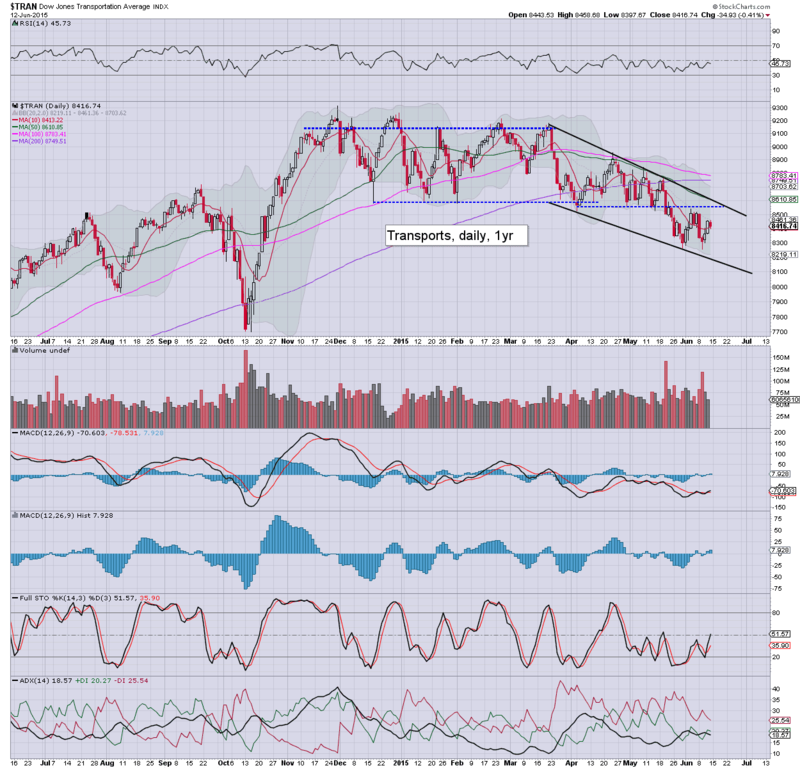 Price action remains choppy - within a broader upward trend, with notable weakness in the Transports. 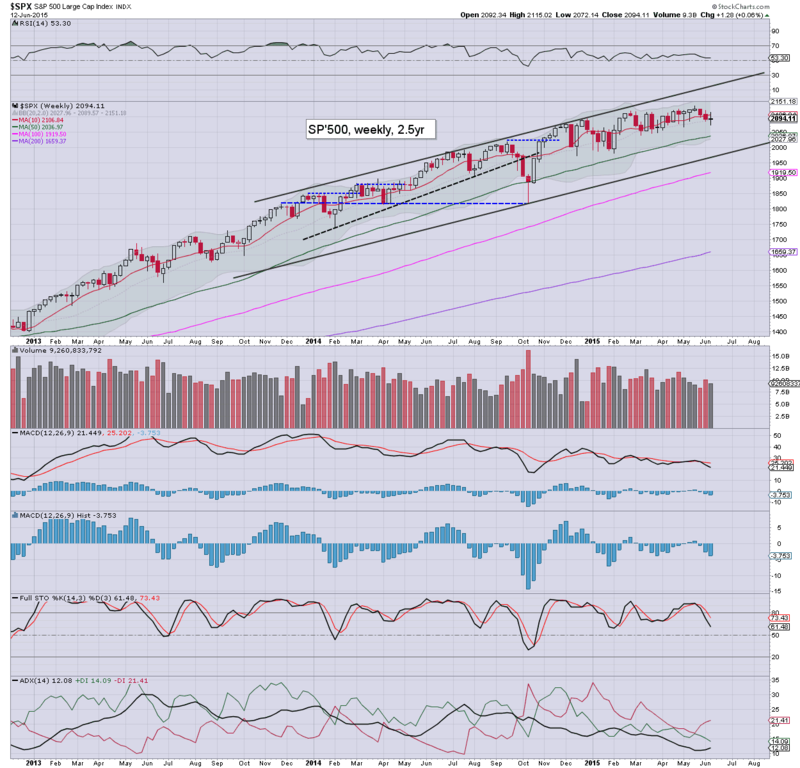 The sp'500 settled the week effectively u/c at 2094. Underlying MACD (blue bar histogram) cycle ticked lower for the third consecutive week, and is increasing negative. 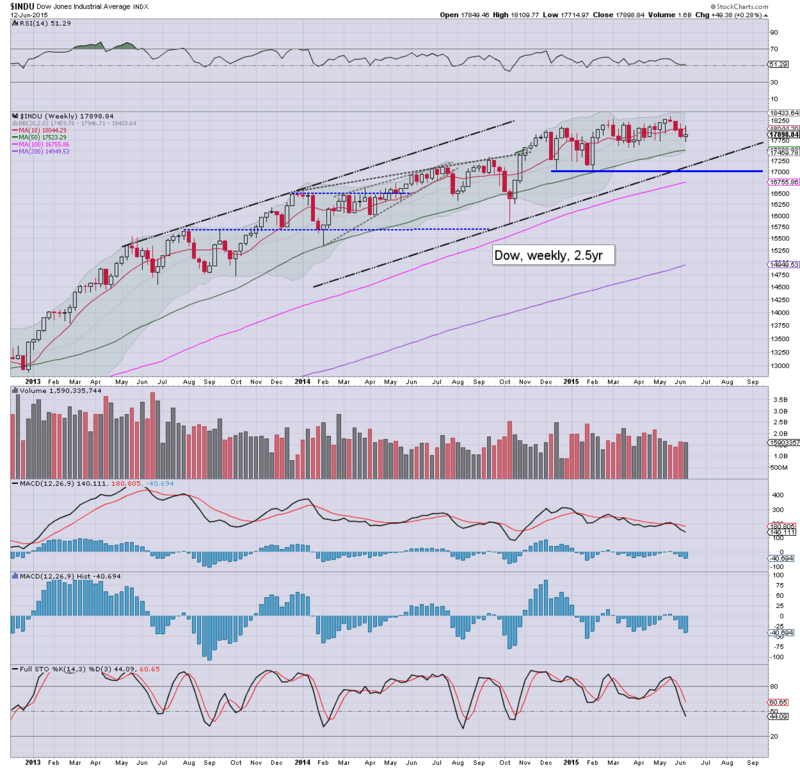 First key support on the weekly cycle will be in the 2030s next week. 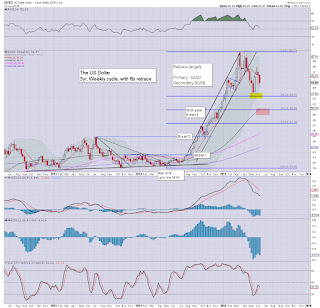 A break under the giant psy' level of 2K looks extremely unlikely in the near term. 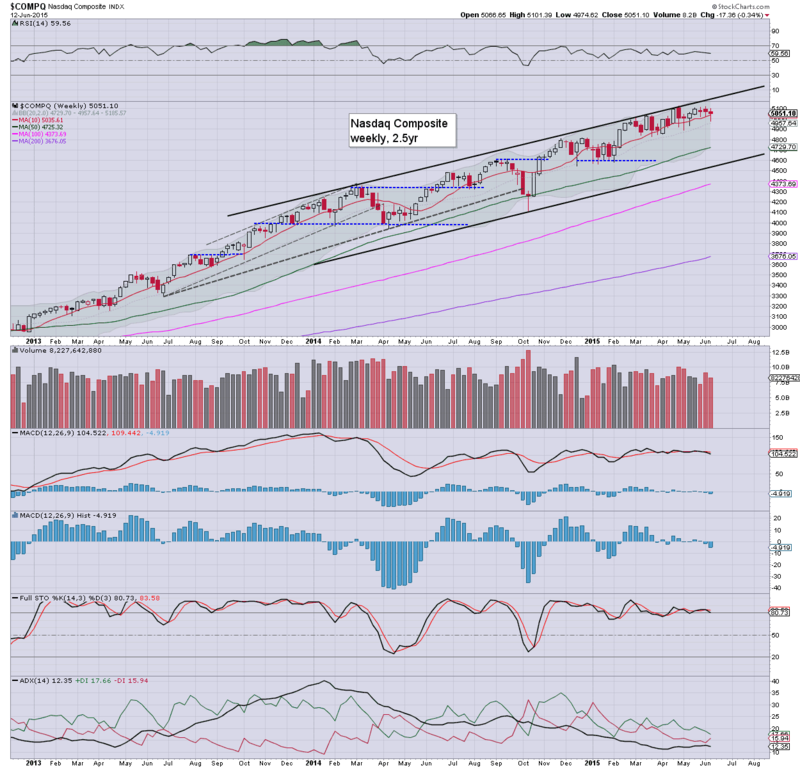 On the flip side, equity bulls should be charging for new historic highs into the 2150s. 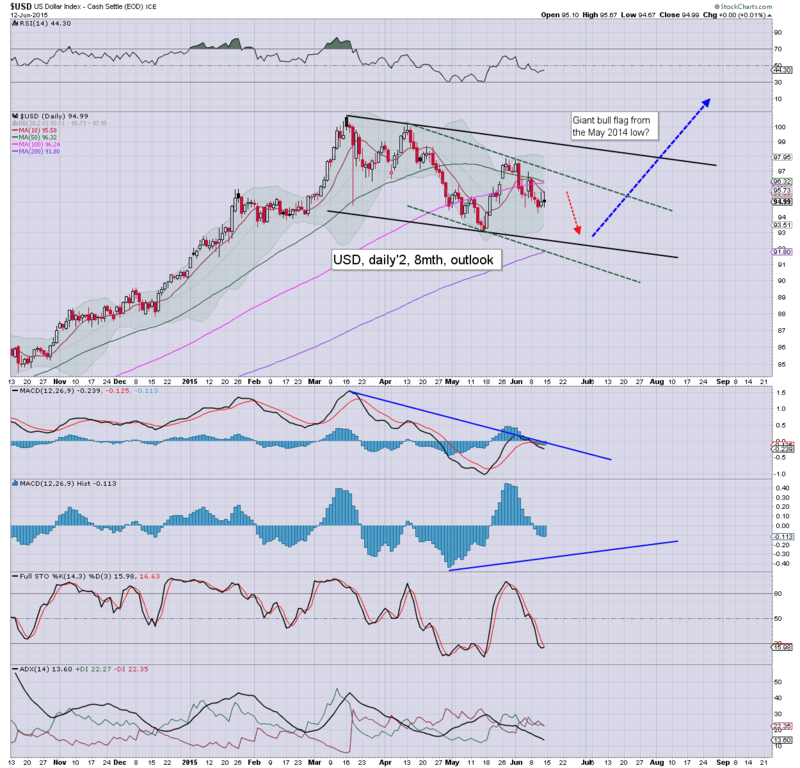 Best guess... a mini washout to the 2050s - where the 200dma is lurking.. before upside into late June/early July.. as the USD continues cooling to the DXY 92/90 zone. 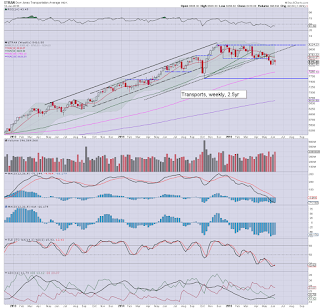 The tech' saw the third consecutive minor net weekly decline, -0.3% @ 5051. 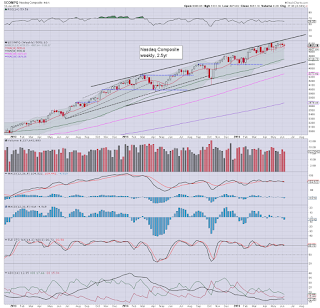 Nasdaq remains close to the March 2000 high of 5132. 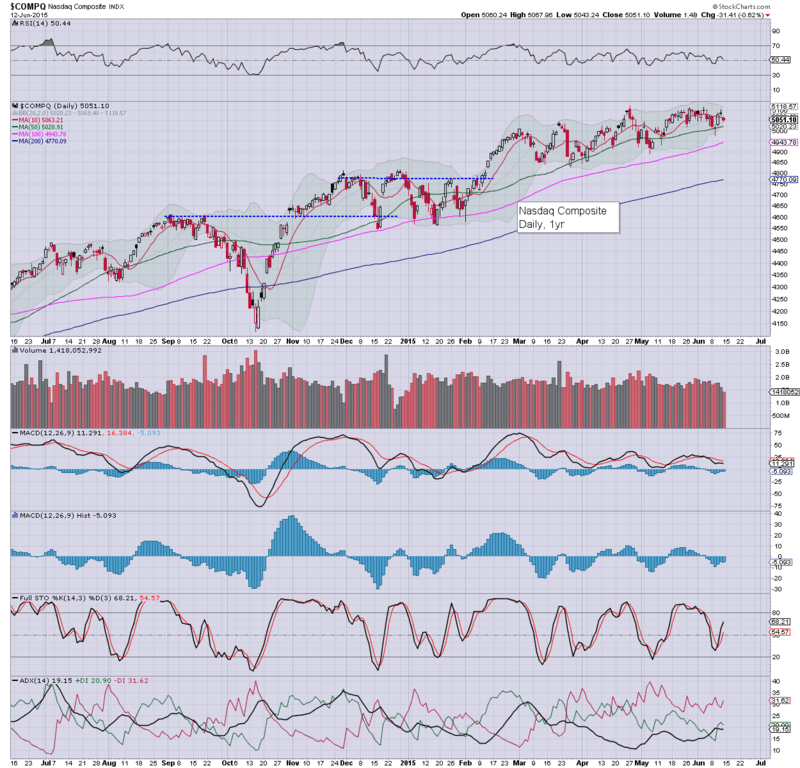 First key support is around 4800, whilst there is viable upside to the 5200s in early July. The mighty Dow saw a net weekly gain of 0.3%, and remains within a tight range since early February. First key support is 17500, with core support at 17K. 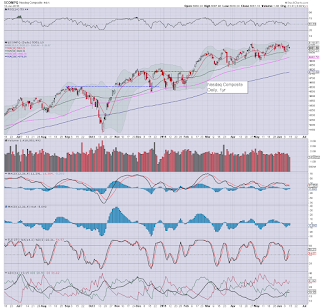 If the market can cope with the next FOMC, there is viable upside to new historic highs in the 18400/600s into July. 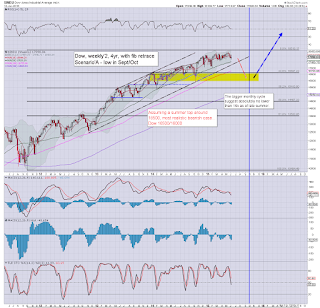 From there, equity bears should be battling for a late summer/early autumn sig' correction down to the 16500/000 zone. 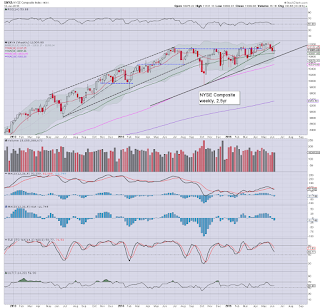 The master index saw a net weekly gain of 0.3%, settling at 11009. Price action has been broadly stuck since summer 2014. If the market gets upset later this summer, the NYSE will be vulnerable to testing the giant psy' level of 10K.. which is a clear 10% lower... equiv' to sp'1925/1875 or so. The second market leader climbed a moderate 0.3% @ 1265. 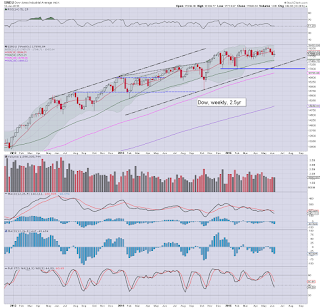 New historic highs are well within range, with the upper weekly bol' offering the 1290/1300s into July. Underlying MACD cycle ticked higher, but remained negative for a sixth week.. setting up a viable negative divergence for a strong wave lower later this summer. 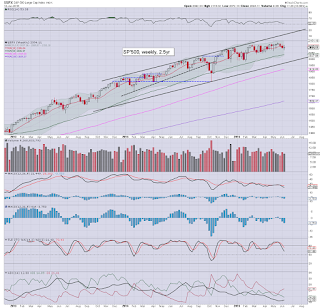 The 'old leader' remains the market laggard, and saw a net weekly decline of -1.1% @ 8416. Price action since last November has been tight, with an increasing slant to the downside. 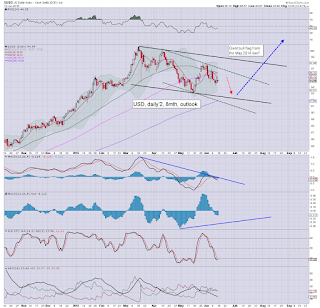 Next key support is the Oct' low of 7700.. which is another 8.5% lower. Another mixed week for US equity indexes. 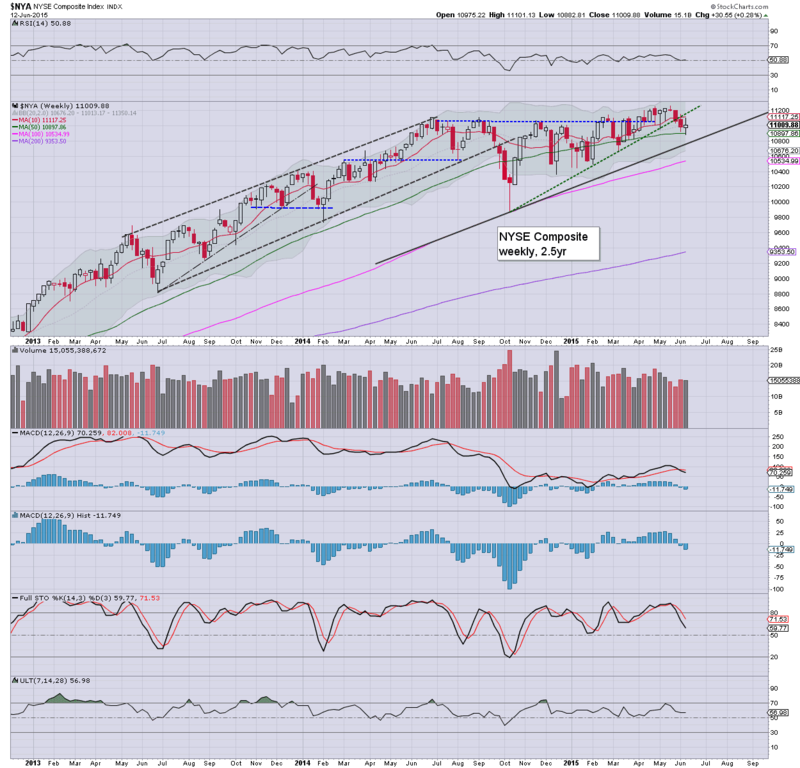 It remains notable that most indexes remain very close to historic highs. Transports continues to lag, and is arguably an early warning that the broader market will see a sig' correction in the late summer/early autumn. At best, equity bears might be able to see a 8-12% down wave into the Aug-Oct' time zone, but with the fed set to raise rates (I realise some still argue against it EVER happening), the market should be able to battle upward into year end, lead by the financials. 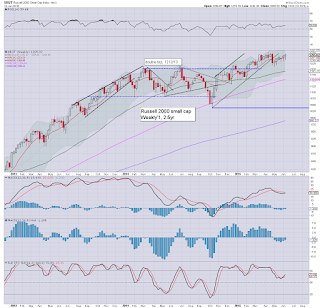 A year end close in the sp'2200s remains very viable. 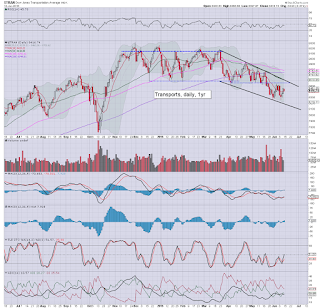 The early year consensus of 2300s looks difficult, not least if the market is trading in the mid/low 1900s this Sept/Oct. Next week will naturally center around the Wednesday FOMC. Market consensus is for no rate hike until the FOMC of Sept 17th. I would be somewhat surprised if the Fed hike rates next week, not least as a number of econ-data points in recent weeks have been somewhat weak. T - weekly jobs, CPI, phil' fed. 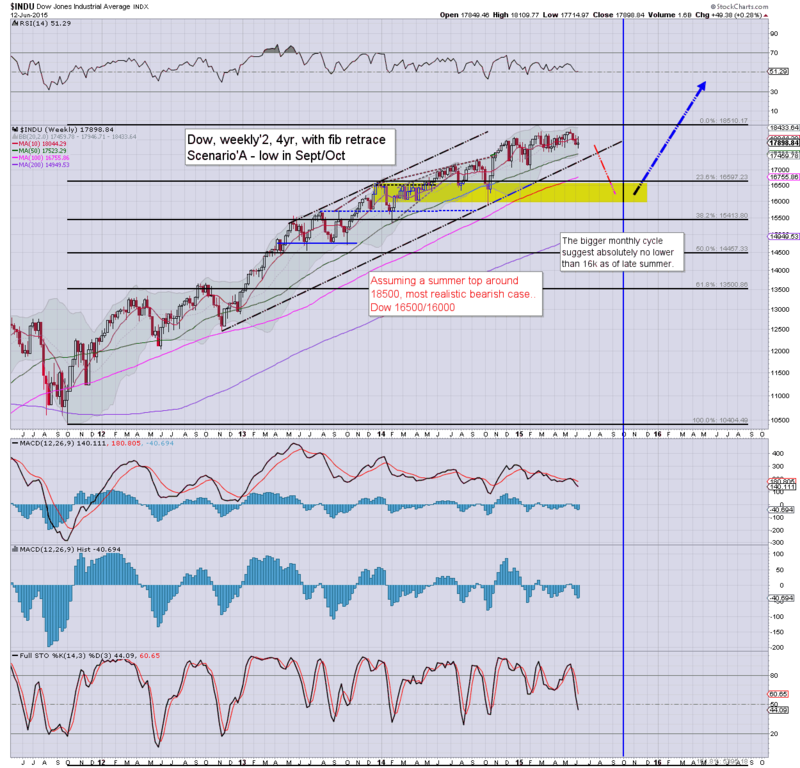 The following remains the most bearish outlook I can see in the late summer/early autumn. If the market does rollover this summer, no doubt the usual suspects will appear and loudly call a 'grand multi-year top'. However, I can't see that as the case, not with continuing QE from various central banks, huge share buybacks, and interest rates that look set to remain broadly low for some years. 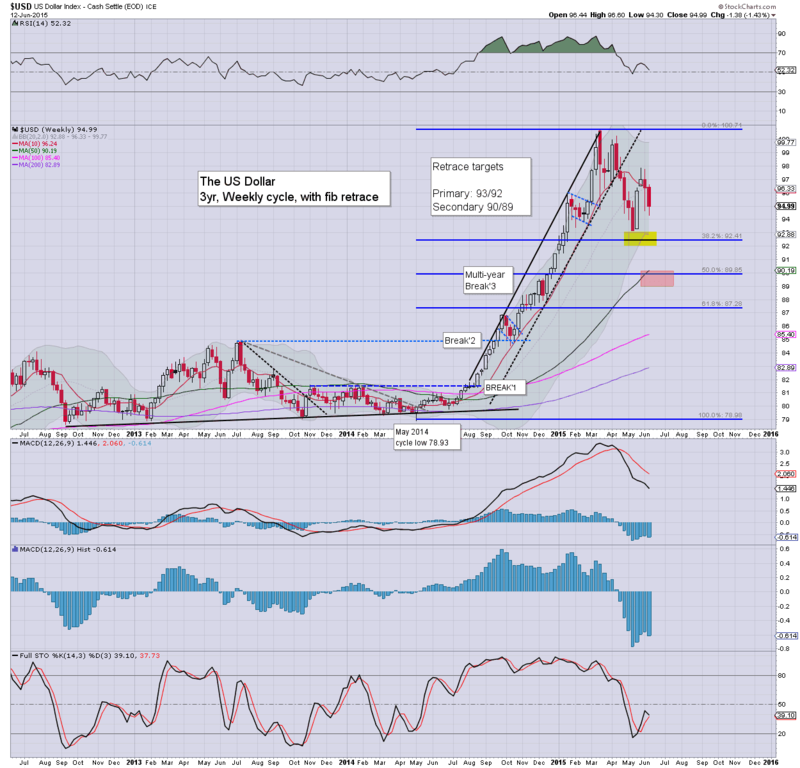 The USD saw a second consecutive net weekly decline of -1.4% @ DXY 94.99. The broader outlook remains on track, with a mid term low (retracing from the March peak of 100.71) in the 92/90 zone, before resuming higher, with a hyper ramp into the 120s. 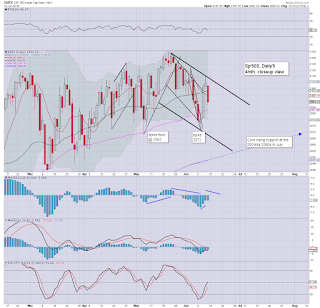 US equities closed broadly weak, sp -14pts @ 2094 (intra low 2091). The two leaders - Trans/R2K, settled -0.4% and -0.3% respectively. Near term outlook is uncertain into next week, with some stocks (such as INTC) suggestive of broader market weakness across next week. 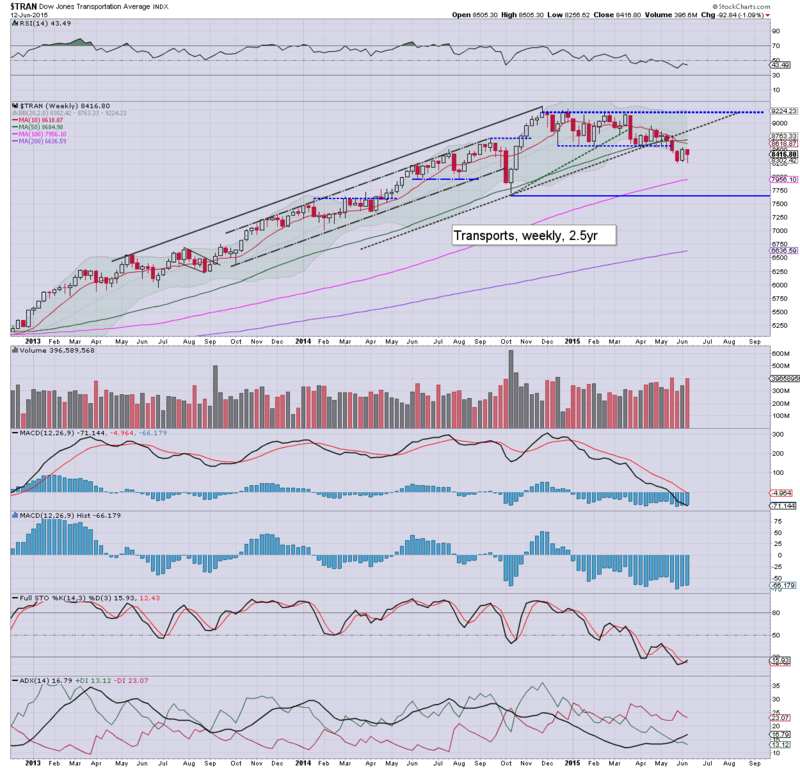 *Trans remains in a moderate down trend from mid March. 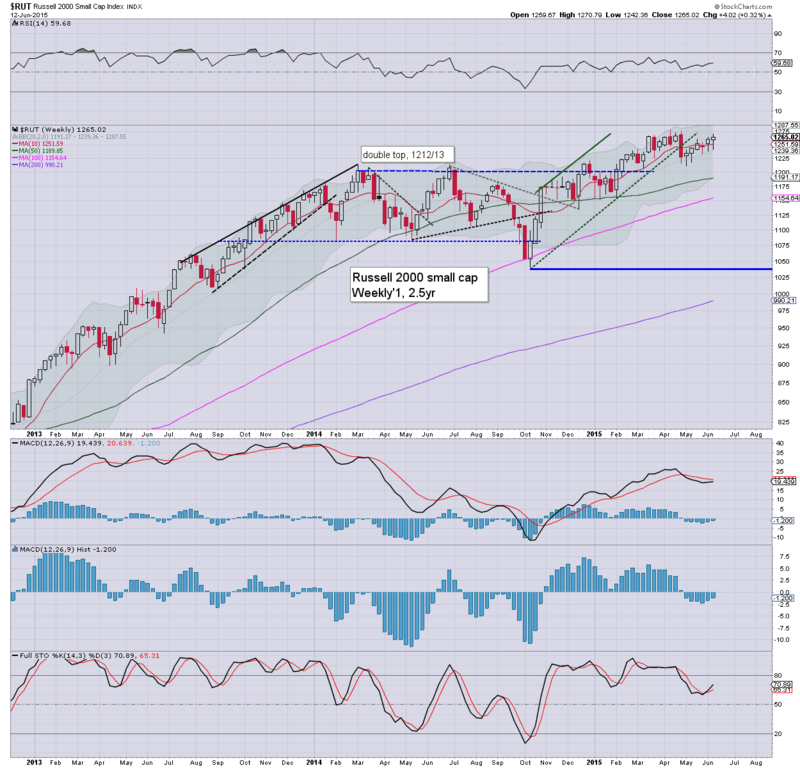 Until it is back above declining trend (8600s next week), it should be a concern to the equity bulls. 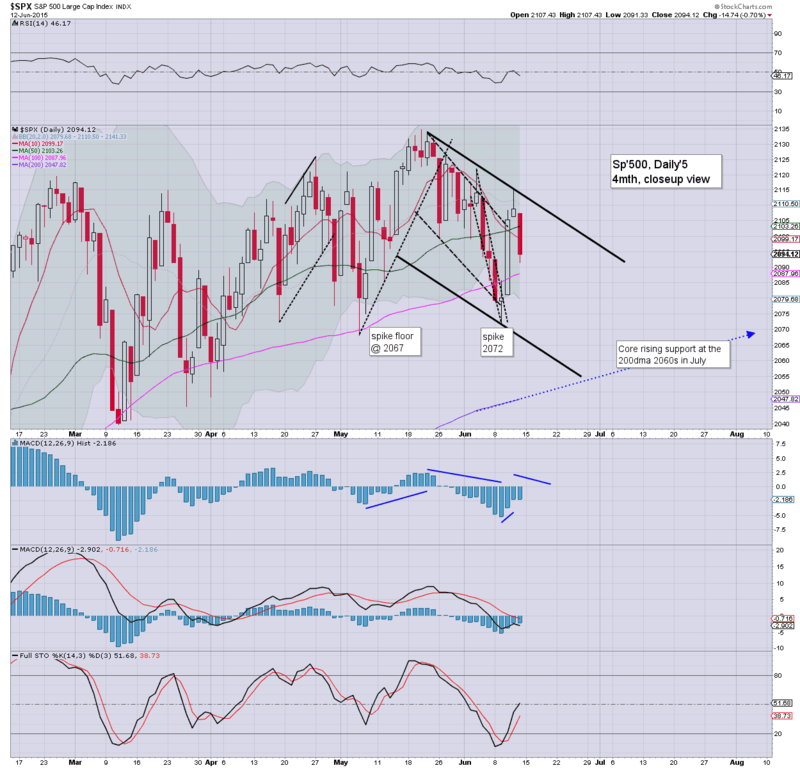 Suffice to add, the recent low of sp'2072 is looking somewhat vulnerable (to my surprise), and if that fails, the sp'500 will be set to test the rising 200dma (2050s).. for the first time since early February.